Jeffy Wong, a member of Mosaic Clubhouse (hosts of the Living Well Partnership) has been having some really interesting experiences since his book Reduce Mental Health Stigma in the Workplace: 5 ways to save money and support your community, was published. This includes meeting the comedian Ruby Wax whose mission, like Jeffy’s is to break mental health stigma. Jeffy takes up the story: “I was intrigued to see advertised a free walk-in session about mental health hosted by Ruby Wax with Peter Fonegy and Marjorie Wallace. Peter Fonegy is the head of the Anna Freud Centre and an expert on mindfulness.Marjorie Wallace CBE is the chief executive of SANE, which she founded in 1986. At present, SANE are running the Black Dog Campaign. The campaign aims to reduce the stigma surrounding mental illness and encourages people to seek help early, rather than suffering in silence. It caught my eye due to my interest in mental health stigma. and I went along on 27 January. Ruby Wax shared her own experience of depression. There was a fantastic response from the hundred strong audience, who asked endless questions. 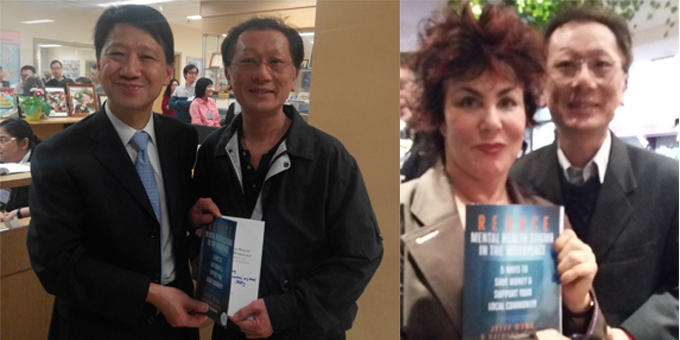 Afterwards I was able to speak to Ruby (pictured above right with Jeffy) and give her a copy of my book. The walk-in was an add-on to Ruby’s show, Sane New World, which ran from 19 January – February 13 at the Arts Theatre, London. I introduced myself to Ruby and outlined the content of the book. She promised to read it and let me have her comments. What inspired me to write and publish the book was that as a Mosaic Clubhouse member, I could see other members develop different skills and move on to employment, which had a positive impact to their lives. More employers needed to hear about the Mosaic TEP (Transitional Employment Program) model. I wanted to target employers who would help members into entry level jobs. Because of the stigma against mental health problems, I found society was against hiring people with these issues. The TEP is one way to tackle this. People get a chance to be in a working environment placement, with additional support. My personal experience was that I had brain tumour surgery, which left me cognitively impaired. I had to relearn many skills. The whole experience caused me to become depressed. I wanted to show that having mental health problems doesn’t mean you are not able to work. When I went to the Clubhouse Conference 2014 in Scotland, I learned about the other clubhouses around the world doing fantastic work. I would like to help to set up a new clubhouse to help more people. I am therefore donating half of the book sale profits for this purpose. Knowing the positive effect of TEP, I want to get more employers involved. I made the first international sale of my book to Gunstein and David from Fontenehuset i Oslo, a Clubhouse in Norway, when they were in Brixton for a three-week Colleague Training course. They were learning new ways to improve their clubhouse, and found Mosaic creative, interesting and inspiring. They read how I wanted to express the value of TEP from both members’ and employers’ perspectives. David said, ‘When we are looking for TEP places, we would like to quote your book, it will be useful to use a positive experience to persuade a potential employer to take up TEP in Oslo. This is the reason why we bought your book. It is also a great story about you’. Fontenehuset i Oslo is located near to the Royal Palace in Oslo and has been going for 15 years; they have 600 members and a daily attendance of around 60. They currently have TEPs with nine organisations, including a car spare parts warehouse, hospital, laundry, National Research Institutions in Oslo, four places in Parliament and Ministry of Health and Care Services. Just as in the rest of the world, they find it very hard to find more employers to take part with TEP due to perceptions about employing people with mental health problems. People who suffer from mental health problems are perceived as unfit for work and the TEP is able to prove the opposite, that many are actually exceptional, and they can make a very positive contribution to the workforce. Reduce Mental Health Stigma in the Workplace, is available from Amazon. Pictured above left with Jeffy is Mr Pang, Chief Executive of HK Land Ltd, who Jeffy met at Phoenix Clubhouse in Hong Kong, where his company is already providing a Transitional Employment Program. Special thanks to Nina Yakimiuk of Mosaic Clubhouse for the original interview.